Today, organizations face tremendous challenges with data explosion and information governance. InfoSphere™ Optim™ solutions solve the data growth problem at the source by managing the enterprise application data. The Optim Data Growth solutions are consistent, scalable solutions that include comprehensive capabilities for managing enterprise application data across applications, databases, operating systems, and hardware platforms. You can align the management of your enterprise application data with your business objectives to improve application service levels, lower costs, and mitigate risk. 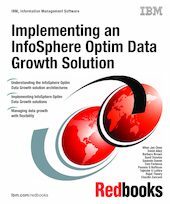 In this IBM® Redbooks® publication, we describe the IBM InfoSphere Optim Data Growth solutions and a methodology that provides implementation guidance from requirements analysis through deployment and administration planning. We also discuss various implementation topics including system architecture design, sizing, scalability, security, performance, and automation. This book is intended to provide various systems development professionals, Data Solution Architects, Data Administrators, Modelers, Data Analysts, Data Integrators, or anyone who has to analyze or integrate data structures, a broad understanding about IBM InfoSphere Optim Data Growth solutions. By being used in conjunction with the product manuals and online help, this book provides guidance about implementing an optimal solution for managing your enterprise application data.